This is how, according to Ledeneva, Putin’s sistema has redefined the Russian public domain. Its diffuse nature allows for the highest possible degree of penetration into households, firms, and universities. Small and medium entrepreneurs, oligarchs and professors form the core of sistema. Globalization has reinforced the role of informality in economic behaviour, because it has increased the opportunity cost of opting out and not becoming part of the new elite. At the same time, business and monetization have facilitated the expansion of sistema in areas that were inconceivable in Soviet times. Sergei Ivanov, Nikolai Patrushe and Dmitri Medvedev have been prominent members of Putin’s St. Petersburg circle that has ruled Russian politics since 2000. Ledeneva analyses the properties of these svoi networks and observes that loyalty is a core element for network cohesion and stability. But how is loyalty enforced in the Russian case? Is it reciprocity or physical threat? Or a combination of both? Ledeneva provides a typology of different network types that are observed in what are often termed the strategic industrial sectors and the bureaucracy. Proximity to the Kremlin and Putin himself are the key criteria differentiating the inner circle, useful friends and core contacts. It is certainly the case that the conclusion of FDI contracts in contemporary Russia occurs through the prism of those categories. Penalty enforcement takes place selectively because of corruption against former sistema members of the system who have decided to defect. What is fascinating here is that while the author starts off by explaining how informal structures are co-opted toward public ends, she also underscores that politics is captured by these personal or quasi-institutional relationships at the same time. Sistema recruits based not just on loyalty and kinship but also on professional criteria. There is a gradual adaptation toward sistema integration. Corruption is treated as a recruitment strategy of sistema, but it does not allow it as a long-run internal practice. There are the checks and balances that preserve the delivery capacity of sistema in terms of public goods, social welfare and technological innovation. The author introduces the idea of reflexive modernisation, thus revealing her belief in Russian civil society’s capacity to implement change by suggesting new rules for policy-making. The reason for this is that the Russian sistema is a rational system, which is more likely to change itself from within than disappear. The book lends itself to a series of fascinating questions that touch the research cores of comparative politics and economic systems. If sistema is the successor form of economic organisation to central planning, then it is essential to estimate its time horizon and efficiency losses with respect to both unconstrained capitalism and state socialism. 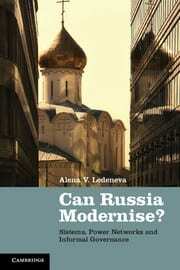 Ledeneva would also make her compelling argument historically much more relevant by offering a historical comparison between Putin’s sistema and Russian politics in the 16th and early 17th century. This is one of the first works that analyse the phenomenon of authoritarianism from a micro-institutional perspective. Rather than concentrating on the mechanisms of aggregate institutional change, Ledeneva understands the durability of sistema and therefore authoritarianism as a series of trade-offs that reduce collective welfare, but not to such an extent that they motivate regime change. This is the locus of sistema’s efficiency: its ability to use the informational asymmetries observed in democratic politics such as cheap talk and moral hazard to generate status quo bias. While Ledeneva does not allow a lot of space for optimism in favour of democratic solutions in Russia, she does imply that reflexive modernization can alter the survival incentives of sistema and make it be receptive to more progressive minds who can eventually integrate it into a politically competitive environment. Theocharis Grigoriadis is Visiting Associate Professor of Economics and East European Studies at the Free University of Berlin.